On Sunday, December 10, the YU Student Medical Ethics Society (MES) held its 11th annual conference, “Breaking Down the Firewall: A Jewish Perspective to Future Technologies in Medicine,” sponsored by Rabbi Dovid and Mrs. Anita Fuld and the Community Synagogue of Monsey, in honor of Rabbi Moshe Tendler. Rabbi Tendler is The Rabbi Isaac and Bella Tendler Professor of Jewish Medical Ethics, professor of biology and a rosh yeshiva in YU-affiliated Rabbi Isaac Elchanan Theological Seminary (REITS). He is also the rabbi of the Community Synagogue of Monsey, and considered a leading expert on medical ethics as it pertains to Jewish law. Rabbi Tendler addresses the audience as Dr. Berman and Rabbi Glasser listen. 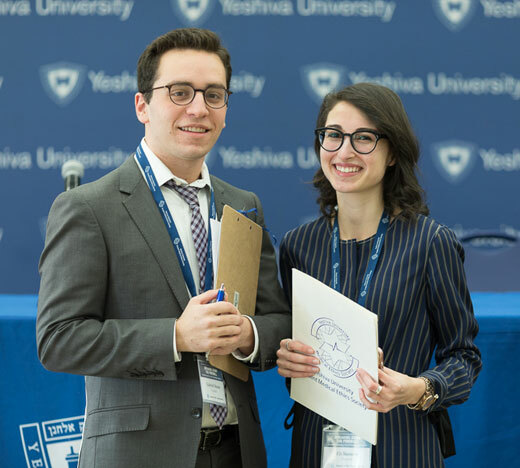 About 200 people, including students from the Marsha Stern Talmudical Academy/Yeshiva University High School for Boys and Samuel H. Wang Yeshiva University High School for Girls, attended the conference’s three plenary sessions. 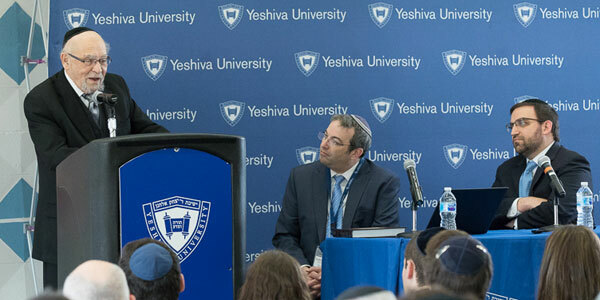 In his remarks opening the conference, Rabbi Yaakov Glasser, The David Mitzner Dean of YU’s Center for the Jewish Future, spoke fondly of being in Rabbi Tendler’s course on medical ethics 20 years ago and coming away with a lifelong respect for how “his incredible combination of scholarship and talent, of conviction and principles, helped us navigate the challenges of the day and find a pathway forward,” the same approach to the subject of medicine and ethics, he noted, that the MES conference has taken for 11 years. The first session, “The Anti-Aging Revolution,” featured Rabbi Dr. Edward Reichman, professor of emergency medicine and professor in the division of education and bioethics, at YU-affiliated Albert Einstein College of Medicine and the conference chairman and mentor to the MES, and Dr. Ana Maria Cuervo, professor and co-director of the Einstein Institute for Aging Research and a member of the Einstein Liver Research Center and Cancer Center. Reichman offered a biblical perspective on aging, noting the declining longevity caused by the Flood, and how Maimonides speculated that a reversal of aging may be in the offing in a future Messianic Age. “Perhaps in the research we will hear about is this coming reversal of our aging,” he observed. The second session, “Playing the Creator with CRISPR,” featured Dr. Neville Sanjana, assistant professor of biology at New York University and a core faculty member and assistant investigator of the New York Genome Center, and Rabbi Dr. J. David Bleich, professor of Talmud and RIETS rosh yeshiva. Dr. Edward Burns, executive dean of the YU-affiliated Albert Einstein College of Medicine, moderated their discussion. As Sanjana explained, CRISPR is an acronym for “clustered regularly interspaced short palindromic repeats,” a process only recently discovered in bacteria in which a bacterium, attacked by a virus, snips out and saves part of the virus’ DNA so that it can activate its immune response if the virus attacks again. The cutting action of CRISPR, he explained, can be programmed to target specific locations on any genome and either add in or cut out genes as needed. In some cases, a malfunctioning gene might be replaced with a healthy copy, such as for something like Tay-Sachs, a genetic disorder that progressively destroys nerve cells and affects the Jewish community. The third session, “Ethics of Neurotechnologies,” featured a conversation between Rabbi Ozer Glickman, RIETS rosh yeshiva, and Dr. Matthew Liao, director of the Center for Bioethics at New York University and editor-in-chief of the “Journal of Moral Philosophy.” They examined the relationship between neuroscience (along with artificial intelligence and the manipulation of big data), philosophy and ethics. Liao pointed to brain research that showed that many cherished notions about human nature, such as rational behavior, are belied by the biology of the brain, because humans act on autopilot much of the time and do not necessarily follow the rational or ethical modes of decision-making that we believe make us distinctive as a species. People seem to respond well to prompts that impact their decision-making in a subtle way, Liao noted, such as posted calorie counts in restaurants and salads made available at the front of a buffet line.